What Does the USMC Have to Offer Women? The past two decades has seen a lot of controversy regarding women’s rights and feminism within the military, especially in times of war. However, time has proven that women are just as capable in holding important and vital positions as their male counterparts, both in and out of combat specialties. Women are now eligible to serve in a wide variety of career fields within the US Marine Corps, including some that go into combat zones. As an equal opportunity employer, not only does the Marine Corps demand and require the same output from female Marines as they do from male Marines, they also share the same pay scales and opportunities in regard to most military occupational specialties (MOS). While the military has yet to allow women everywhere their male counterparts are allowed to go, women have come a long way since they disguised themselves as men to fight right alongside them in the Civil War, or served as front-line nurses or stretcher bearers in the Great War, as well as filled hundreds of male positions during World War Two. Since Korea and Vietnam, and the conflict in the recent past, women have made steady process entering formerly male dominated careers and specialties. US Marine Corps jobs for women include some of the most demanding jobs the Marine Corps has to offer, including high tech jobs, aviation, medical fields, and other high stress and high demand careers. Women are encouraged to enter technical and weapons fields as much as they used to be encouraged to enter office or administrative jobs. There are women out in the fields of Iraq and Afghanistan who, although not in infantry units, are no less in danger than their male counterparts. Every Marine, male or female, offers great examples of career opportunities that are well suited to different personalities as well as abilities and skills. 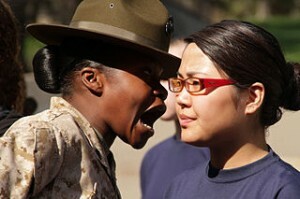 The Marine Corps continues to offer education and training for both sexes. It should be a human ideal to have a world that is ruled by no one but in which all people, male or female, black or white, act as a single unit. That is exactly what the Marine Corps are; a world where every Marine is equal to every other Marine; a world that acts as a single unit: The United States Marine Corps.